1. Place the baked pie crust (in the tin) onto a large baking sheet to prevent any possible spillage. 2. 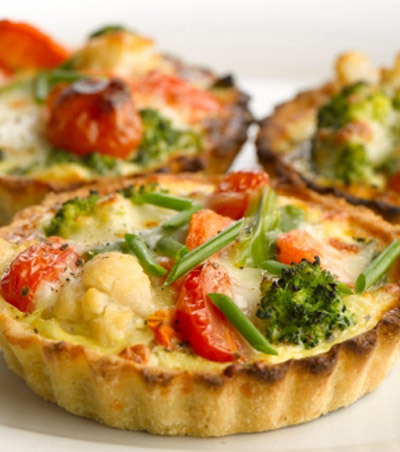 Arrange the mixed vegetable pieces, onion and smoked mozzarella in the bottom of the pie crust. Cut a small deep cross into the ends of the tomatoes and sprinkle the cut ends with a little sugar. Tuck them into the vegetables, the cut ends facing uppermost. Season to taste with the salt and black pepper and sprinkle with dried origanum. Sprinkle with the grated cheese. Whisk together the half-and-half and eggs and pour over the vegetable and cheese mixture. Bake in the oven preheated to 190º C for 25 – 35 minutes or until the filling has set and is golden. Unmould onto a serving platter, tuck in the fresh herb leaves, slice and serve warm. This kind of quiche is perfect for meatless Mondays. And if you add some tasty salami or ham cubes to the mix, you have a meal for all days and many kinds of occasions.